As Ava alluded to in her State of Disc post, Rapture isn’t the same as it was back in ICC. Even if your shields all break at the same time you are only going to get one tick of Rapture equal to 6% of your total mana and then trigger it’s 12 second internal cooldown. Discipline Priests need to be certain they are getting the most out of this talent, and maximizing its restore. 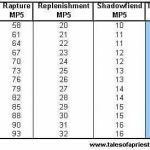 When compared to Holy Priests, Disc gets far less mana back from Spirit, and relies more heavily on Intellect Based Mana Restores– with Rapture being our largest source. Rapture is a game all Disc priests must play. Assuming Non-Heroic T11 Mana pools, Rapture should be restoring ~7,000 mana per Rapture. (+/- a few hundred varying by gear, gems, chants and raid make-up). You should be using Rapture every time it comes off cooldown– by doing this, it will enable you to maximize the amount of mana you get back from it. 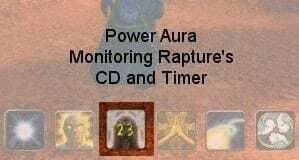 The first thing you need to do is track your Rapture cooldown. From there, you’ll be able to recast your PW:S and start the Rapture cycle over again. One way this can be done is by using an addon that will do it for you. Ava’s post pointed to Ingela’s Rapture Tracker, while I have been using a very simple Power Aura to track Rapture for me. Both are excellent ways to manage your Rapture CD. This aura will have the Rapture icon appear when you proc it, and the 12 second ICD timer begins, once that 12 seconds expires, I am notified with an audio cue and the icon fades away. At that point, I am free to recast Power Word: Shield on a target (ideally a Main Tank for a rapid Rapture proc) to regain another 6% mana from Rapture. With most fights having large amounts of AOE damage, even if the Tank(s) has Weakend Soul, I will nearly always have a target for PW: Sheild as they’ll quickly take enough damage to break the shield and proc Rapture. Rapture is your best friend when it comes to mana restoration… use it!